Most people know of Guy Fawkes and the 1605 Gunpowder plot to blow up James I and his parliament because of Catholic oppression. 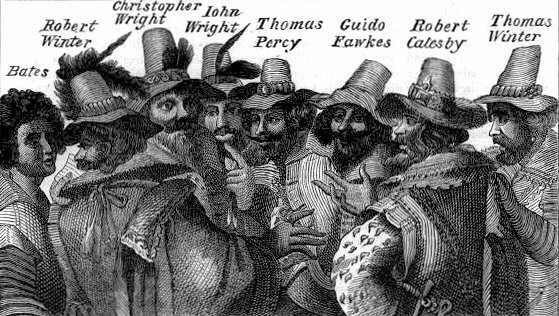 But few know the names of the other main conspirators: Robert Catesby, who was the originator of the plot, Thomas Percy, John Wright and Thomas Wintour.On 20 May 1604, in his Lambeth house Catesby made Thomas Percy and Guy Fawkes swear an oath of secrecy taking them into the plot to kill King James and his (Protestant) Parliament. Although Fawkes was caught in the cellars under Parliament, most of the other conspirators fled to Holbeche House in Staffordshire. Some of these were killed when gunpowder they were drying exploded, others were killed resisting arrest leaving just nine members of the 60 plus plotters to be hung, drawn and quartered in January 1606. It is interesting to note that Pain’s Fireworks was based at nearby Elephant & Castle and Charles Pain supplied Guy Fawkes with gunpowder.